As a winter flowering evergreen shrub Azara microphylla has foliage that in itself is attractive throughout the year, however with masses of little golden yellow flowers held beneath the drooping branches in winter it does have another attraction. Its not that the flowers are ‘stunning’, rather small and ‘fluffy’ however they are fragrant. We have called this a shrub, however perhaps with its growth habit you could more correctly call this a small evergreen tree. The leaves are small and held close to the branches. 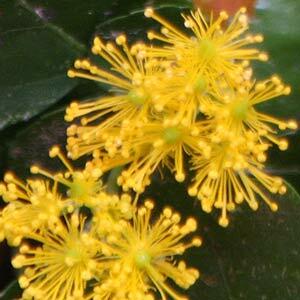 Also know as the ‘Box Leafed’ Azara for the shape of the foliage. Flowers are perfumed with a ‘vanilla’ scent, and this plant can reach 4-7m depending on conditions. most often in cultivation a height of 4m is usual. Is this a good plant ?Its been in cultivation for over 100 years. Not promoted much by landscapers, but much appreciated by gardeners in the know. From Chile and Argentina this lovely plant does need some protection from frost especially when young. A semi shaded position in a humus rich soil is best. Some moisture during summer is required. You can prune back dead wood at any time. If pruning to size or shape, prune just after flowering.